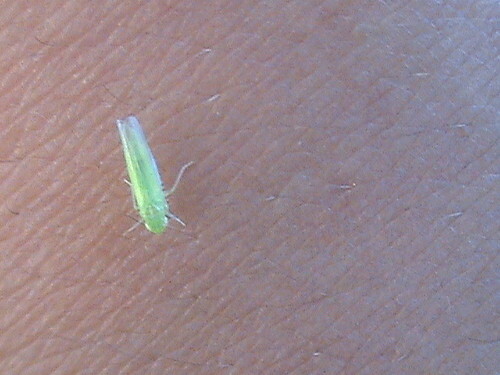 ive been noticing these little leaf hoppers near and around my lettuce and tomatoes. Im not sure what they are but i do have a lot of them and from what i can see, ther isnt damage being done?? any body got a clue what they are? ?I first thought grass hopers, but they stay small and arnt eating my foliage. Also while examining my tomato i came across this? I have been trying to be friendlier to the non problem critters roaming around so i spray my vegetables with a garlic, soap & pepper mist. These leaf hoppers donÃ¢â‚¬â„¢t mind it and that thing either. So i just wanted to confirm if these two are beneficial insects before i start to hand pick. Last edited by top_dollar_bread on Wed Jul 22, 2009 6:35 pm, edited 1 time in total. 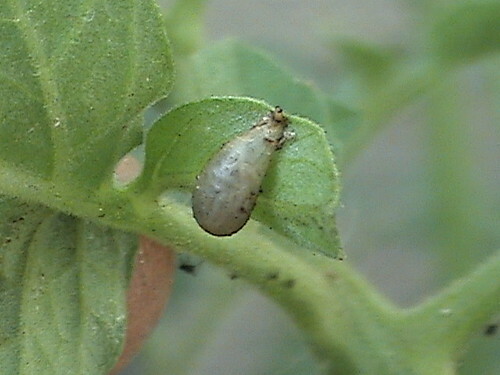 Many species of leafhoppers exist in home gardens throughout North America. 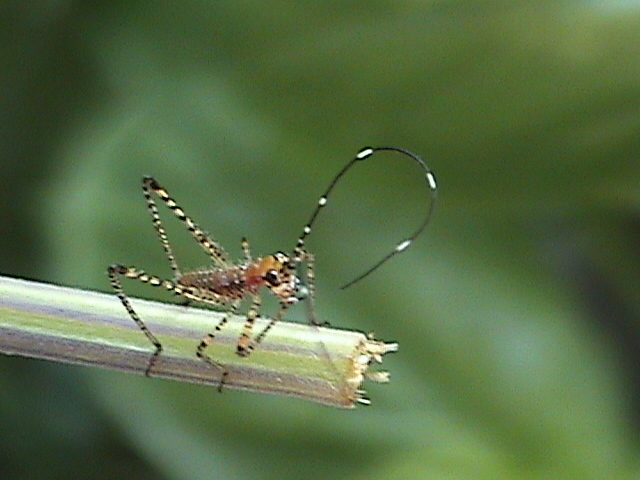 Both adults and nymphs feed by puncturing the undersides of leaves and sucking out plant juices. Their toxic saliva causes spotting (white specks), yellowing, leaf curling, stunting and distortion of plants. They are also responsible for transmitting the organisms causing virus diseases in plants. Common host plants include beans, lettuce, beets, potato, grapes, roses, and many others. Don't know what the ugly thing in the bottom two pictures is! the information on the leaf hoppers really helped. After taking a closer look, my lettuce does have tiny white spots all over it. Ive been using dish washer soap mixed with worm water but they seem to just hop away and come back later. Ive also occasionally used fish emulsion with the same results. Im familiar with DE, but im worried about using it. You see....my lettuce is planted next to my fennel and basils. In my fennels i got a few baby prey mantisÃ¢â‚¬â„¢s roaming the foliage and im worried that the DE might kill them as well. From what i have read, DE works by eating away insects exoskeleton? Is this correct and will DE effect my mantis buddys? The DE, diatomaceous earth, is effective against crawling insects that rub over it, like ants and silverfish. It also works against slugs and snails. It won't harm your praying mantis, which walks above it on tall legs. The Bt, bacillus thuringiensis, is used because it is host specific. 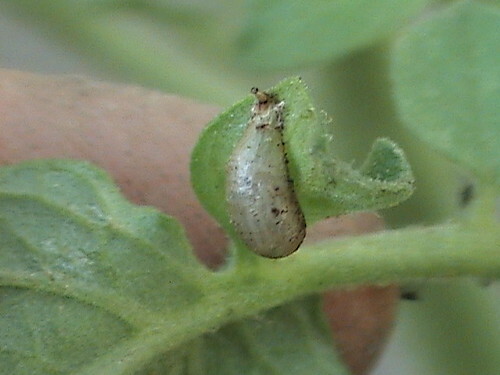 It targets only the larvae of leaf-eating lepidopterans (moths and butterflies). The hornworm is the larva of a moth and would be eradicated by it, but in the process you would also lose swallowtail and other butterflies you might like having in your garden. But the praying mantis would not be harmed. non-target Lepidoptera, but noted recovery by the third year(16). Predators include snakes, toads, cats, mice, a number of birds (bluebirds, sparrows, mockingbirds and others), chickens, ducks, geese, spiders, horsehair nematodes. 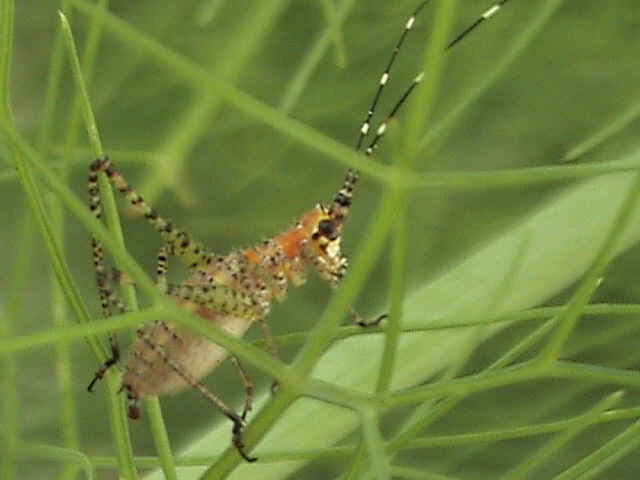 Barriers: grasshoppers are said to be repelled by horehound, cilantro, calendula, garlic oil, and nitrogen-fixing crops like peas and sweet clover. Row covers, like Reemay, or screens can be effectively used to keep them from your crops. To make: Combine 3 ounces of minced garlic cloves with 1 ounce of mineral oil. Let soak for 24 hours or longer. Strain. Next mix 1 teaspoon of fish emulsion with 16 ounces of water. Add 1 tablespoon of castile soap to this. Now slowly combine the fish emulsion water with the garlic oil. Kept in a sealed glass container this mixture will stay viable for several months. To use: Mix 2 tablespoons of garlic oil with 1 pint of water and spray. Im thinking with the DE i can just sprinkle the dust on the trails and around the base of my plants. I will also use the garlic fish emulsion spray recipe you mention as a foliar defense against the grasshoppers and hornworms. Im thinking that by using both methods along with the cilantro barrier i can really control my pest populations. What do you guys think? any budy know what this is?? good/ bad? 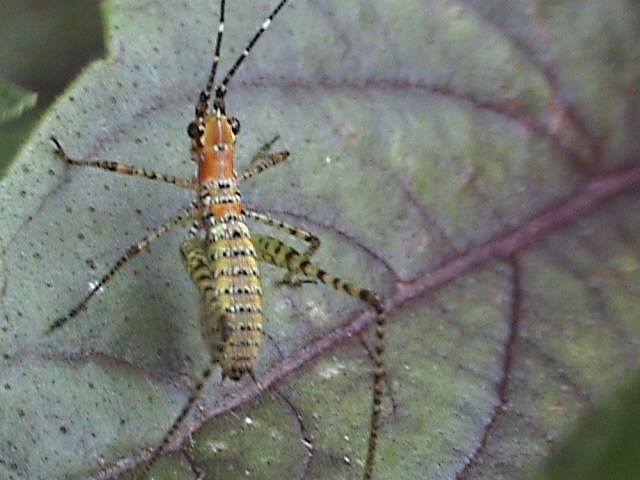 i have spoted these critter's on my sage, fennel, and basils. Ive yet to catch them eating my plants and they seem to be following and hanging out near the mantis's. 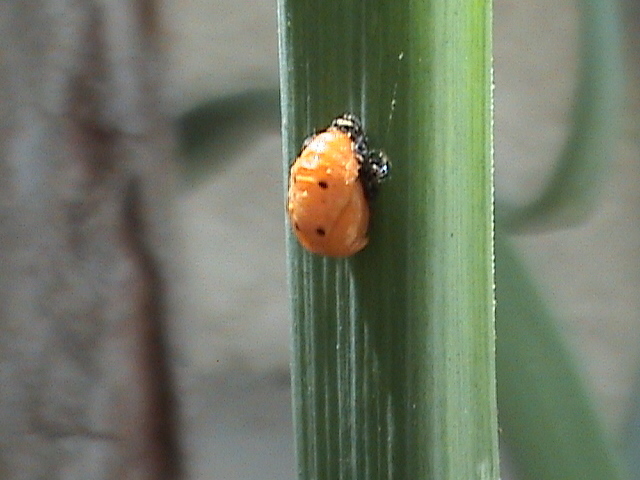 That would be a Lady Bug Pupae (spelling?). Hope you have a lot of those! The other thing looks like some type of grasshopper. Praying Mantis love to eat grasshoppers, I suggest going to your local nursery and getting a pod. You can also make some hot pepper spray by soaking red pepper flakes in hot water, covered, overnight...straining them and pouring it into spray bottles (just be careful not to get it in your eyes! ) Then just spray the stuff that's getting munched. Insect identification first time gardener.